If you have not seen any of Series 2 of Sherlock, please note that this article is very spoilerific and I will give away plot points to not only this episode but the entire Series 2. If you do not want to be spoiled please do not read further or read at your own risk. It is very rare for me to write about something that has been broadcast in the twenty-first century. Pretty much by design my blog exists to celebrate classic British television mainly from 1950s to 1980s. That is not to say nothing good was made in this century (in fact quite the opposite) but I know what I generally prefer. A major exception to the rule here is Sherlock. Sherlock is the twenty-first century modern day version of Sherlock Holmes. It generally is a visual stylish treat that is a feast for the eyes and usually is accompanied by a great story. Sherlock employs a lot of the technology available to us now and often a highlight is dialogue presented on screen as characters are texting each other. The whole thing is very enjoyable. During the month of May I like to indulge myself with a theme that runs throughout the month. Here in the US, May is the time of year that new episodes of a TV season to the end of the run taking the summer off. Often this means that TV series end for the year and will return that fall or it may be the end of the series all together. I thought it would be fun that everything I pick and watch during May is a final episode of a series or season. A strong start to this would be by picking Sherlock which means picking The Reichenbach Fall. Series 2 of Sherlock has been taking Arthur Conan Doyle titles and have been skewing them based on the story they are based on from the original source. 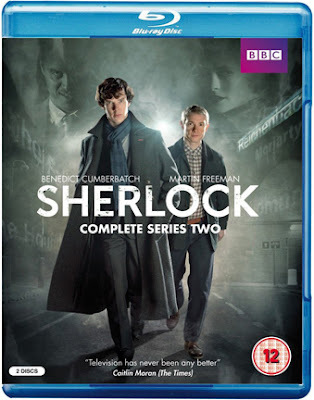 A Scandal in Belgravia is a takeoff of the title A Scandal in Bohemia, The Hounds of Baskerville is a takeoff from Hound of the Baskervilles and finally The Reichenbach Fall is loosely based on The Final Problem. Going into the episode it is clear that as it was the finale for series 2 and based on The Final Problem, things were not going to go well for Sherlock. To prepare for this article, I watched all of Series 2 over the course of 3 days as I had not seen it before. I recently got the Blu Ray discs and sat down and thoroughly enjoyed the series which I thought was better than Series 1. I think one enduring theme that ran through Series 2 was how Sherlock Holmes was starting to gain the notice and attention of people who were aware that he was solving mysteries. Holmes was becoming a sensation. John Watson keeps a blog (which is a lot more successful than this one) which chronicles the cases of Holmes. This is the modern day equivalent of the journal Watson kept in the late 19th century. 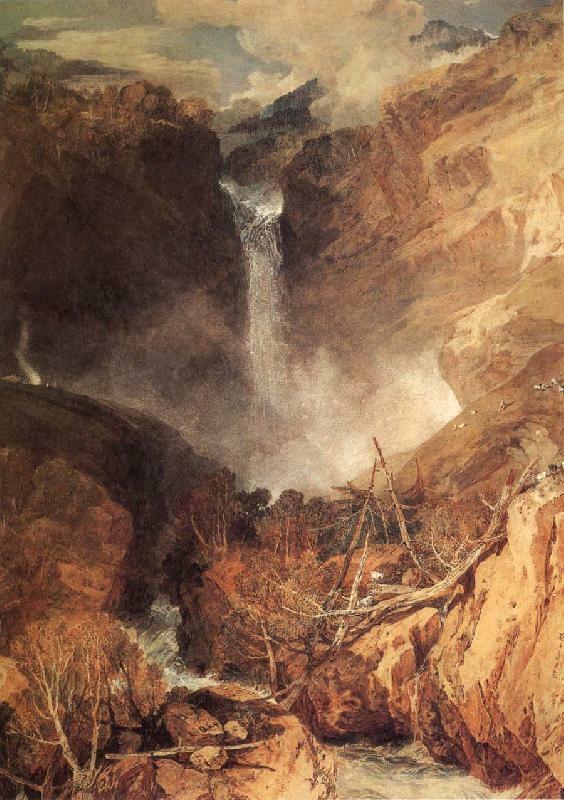 By the time we get to the start of the episode, Holmes had just helped the police track down the painting of The Reichenbach Falls. It is the case that garners the most attention for Holmes. Holmes is not interested in getting this attention but the attention is there. With each case we see Holmes and Watson getting accolades for, we see people lavish attention on the amateur sleuth. Another theme that equally has been running through Series 2 if not the entire series is how difficult Holmes can be to other people and how badly he wants to show off how clever he is even when he is not trying. This is not really to impress anyone but more so he can show himself how clever he is. Watson is constantly trying to tell Holmes certain things he can do to allow himself to come across to others more graciously or even just more human. Even when solving the cases we see at the beginning of the episode, when people try to give him tokens of their thanks, he doesn’t even handle that very well. Granted one gift was a deer-stalker hat. There is only one person as smart as he is who knows Holmes weakness and knows exactly how he is going to bring Holmes down. 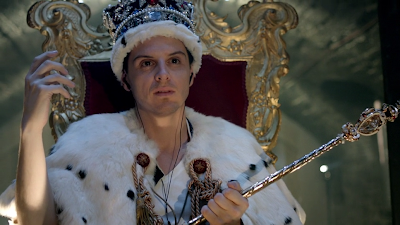 Jim Moriarty. We first learn about Moriarty in A Study in Pink. Throughout all the episodes we pick up a little more information on Moriarty until we finally meet him in The Great Game. When the series returns with A Scandal in Belgravia, we know that Moriarty is going to come back after Holmes. After all the action dies down from Hounds of Baskerville, the episode ends with a shot of Moriarty who has been imprisoned or being questioned. Holmes’ brother Mycroft is there but when Moriarty is let out of the room, all that is scratched everywhere on all the walls is Sherlock’s name. For a man who is a consulting criminal and is extremely powerful yet lives in the shadows, he comes out in a big way. At the Tower of London, Moriarty is able to disrupt the security there plus at 2 other places (Bank of England & Pentonville Prison) seemingly from his phone. On the security camera that he knows the footage will eventually be seen everywhere, he writes on the glass case of the crown jewels, “Get Sherlock”. Moriarty does nothing to avoid arrest and is brought in with a court case looming. Sherlock is being called onto the court as a star witness to testify against Moriarty. Before he goes to the courthouse, Watson and Sherlock leave 221B Baker Street to find a crowd of fans cheering them on as they leave to testify. Once at the courthouse, Holmes gets accosted by a young journalist in the men’s room, Kitty Riley, who wants to get the “real” story of Sherlock and run a feature on him. Sherlock tells her that she (as a journalist) repels him and leaves to go testify. Throughout all of this Watson reminds Holmes that he needs to just answer the judge’s questions and not to be condescending to the judge or anyone in the courtroom. Unfortunately it doesn’t really go like that as Holmes’ rudeness and smugness lands him a contempt charge and he is jailed and needs to be bailed out. Moriarty’s case is no case at all. He calls no witness and does not allow his defense to cross-examine any one. Ultimately, it doesn’t matter as Moriarty is found not guilty of any of the crimes by the jury. Of course the reason the jury found Moriarty innocent is because he was going to kill their families if they found him guilty. Once Holmes finds out that Moriarty is not guilty, he knows that Moriarty will come and see him. Moriarty enters 221B Baker Street and sits down with Sherlock Holmes for some tea. Moriarty explains that he has some code that allows him to get into anything, anywhere. The code is simple yet is highly sought after. Moriarty also threatens that he will finish off Holmes at some point soon. Moriarty carves into the apple he was eating I.O.U. and these three letters show up in a few places throughout the story almost like "Bad Wolf" in Doctor Who. Moriarty’s visit accomplishes a couple of things. 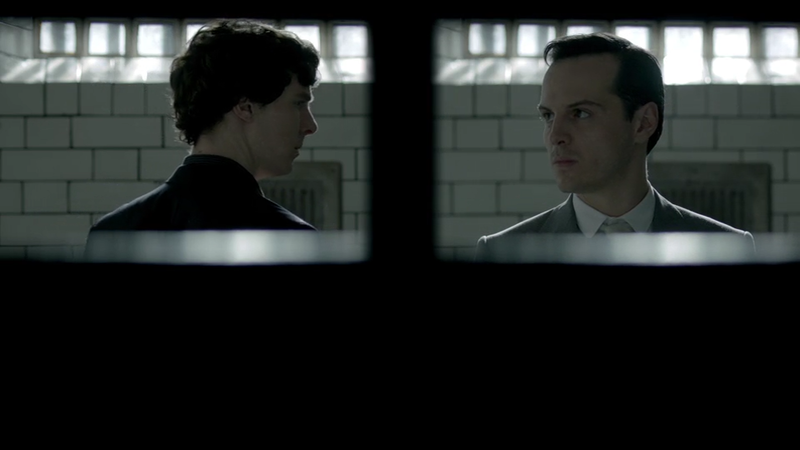 Moriarty needed to threaten Holmes but also other people may have seen Moriarty visit Holmes. That is important because Moriarty implies that Holmes has the programming code to get into anything. 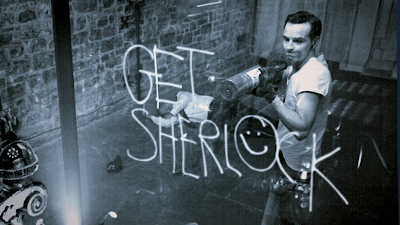 He lets the world know this through him writing “Get Sherlock” on the case of the crown jewels. Suddenly within feet of where Sherlock lives, there are known assassins moving in around Holmes. This is where it gets interesting because we start to get to know Moriarty’s plan and it is pretty ingenious. The plan isn’t so much about killing Holmes (at least it doesn’t seem that way at the start) it is more about discrediting him. Sherlock is asked to investigate missing children of the British Ambassador to the US. Holmes using his genius of observation to solve the case finds the children relatively easy. The kids are scared but safe. A couple of officers have questioned them yet when Holmes questions the little girl, she screams in terror implying he took part in the plot. In fact, Lestrade’s people start to believe Sherlock has been responsible for all the cases he has solved with them. This starts to be investigated further as a warrant is brought out for Sherlock’s arrest. In fact, Lestrade approaches the Police Superintendent to get a warrant. There the Superintendent finds out the Sherlock has been helping Lestrade solve these cases. He is shocked and angered that Lestrade has allowed this outsider to work on these cases and solve them on behalf of the police. Where the hell has this guy been? The opening of this episode is nothing but scene after scene of all the accomplishments that Holmes was able to do solving cases. Lestrade is in some of the shots and all covered by different types of media. Holmes was famous yet this guy knew nothing about him? To me that was silly. Watson must have agreed with me because he was arrested just after Holmes after he punched the Police Superintendent in the face. They both escape but decide to seek out Kitty Riley. Going to Kitty Riley’s house, they have a conversation with her only to be interrupted by Moriarty entering the living room. He freaks out when he sees Holmes. You see, apparently there is no Moriarty. Moriarty was a character that Holmes’ created as a way to stage all of his cases he solved thus becoming famous. In fact Moriarty was an actor names Rich Brook who was famous for presenting a children’s television program. Rich Brook is also translated as Reichen Bach in German. Kitty knows Rich because she interviewed him about his role in Holmes’ weird world of perpetrating his own successes by masterminding the cases he solved. Because of the article Kitty wrote, Holmes is a fake. Kitty explains to Holmes that he repels her as she is happy to get the last word to him before Holmes and Watson depart. Holmes and Watson go separate ways. Holmes goes to Molly at the hospital to get her help on something that we never know…or do we? Watson goes to the Diogenes club to have a word with Holmes’ brother Mycroft. Mycroft explains that while they had Moriarty in custody they could not get him to talk at all. They would question him and even beat him yet he would yield nothing. Finally, it wasn’t until Mycroft started to give information about his brother to Moriarty that he would start saying something. An interesting and pretty cool thing about the scene in the Diogenes club is that when Watson enters the club the first time in the story, there is a man who is unhappy that Watson is there and raises a bit of fuss about him being there. 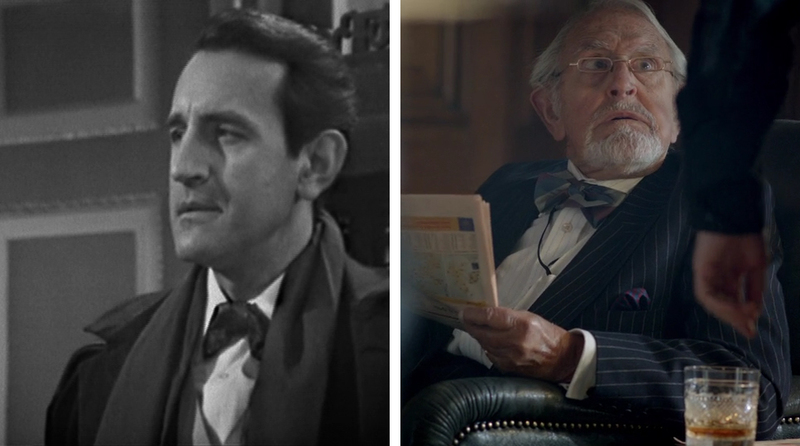 The actor who played him was none other than Douglas Wilmer who played Sherlock Holmes for the BBC from 1964-1965. If you have never seen his version of Sherlock Holmes, I highly recommend it. It’s only available in the US currently. The series is in Black & White and is quite, quite good. Watson reconnects with Holmes at the lab at the hospital. While there, they get word that Mrs. Hudson has been shot. Watson frantically tries to get Holmes to go back to 221B Baker Street with him. Holmes refuses much to Watson’s annoyance. 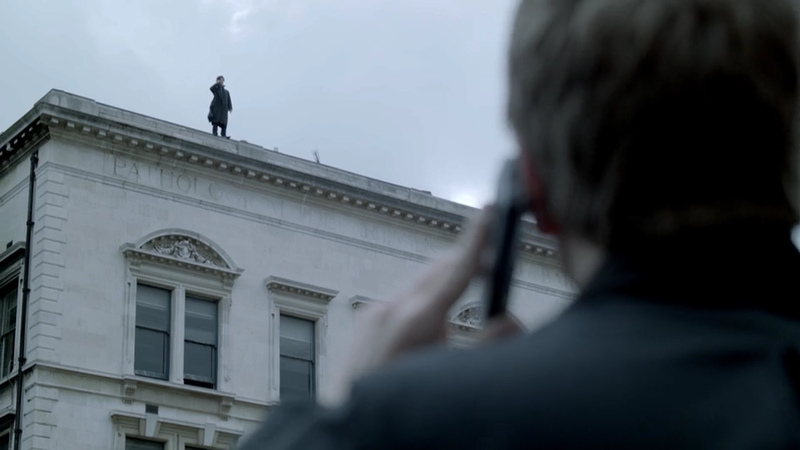 Holmes knows that Mrs. Hudson is not shot and when Watson leaves, Holmes texts Moriarty to meet him on the roof to solve their final problem. Moriarty has a surprise for Holmes. Moriarty explains that there never was a computer code that could open anything in the world. It came down to bribing people who were in the position to make the security lapse. Moriarty explains to Holmes that Holmes needs to jump off the Hospital roof and kill himself or snipers are ready to kill off Mrs. Hudson, Watson and Lestrade. Holmes would die disgraced and as a fraud but his three friends would be safe. 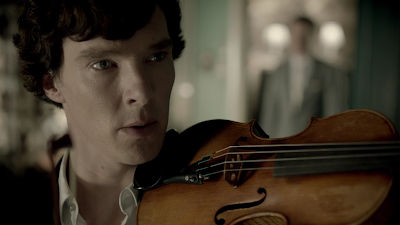 Holmes realizes that of course Moriarty would have a fail-safe that Moriarty could use to call off the killings. Holmes will do anything to get Moriarty to initialize the fail-safe. Moriarty admits they are both alike but then takes out a gun and commits suicide right in front of Holmes. Moriarty is dead which means the fail-safe is now gone. Holmes is forced to having to commit suicide or his friends die. Back at 221B Baker Street, Watson sees that there is nothing wrong with Mrs. Hudson and heads back to the hospital. As he is outside, Holmes calls him and tells him to look up. 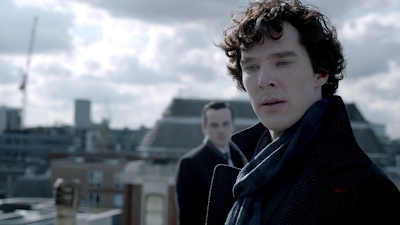 Watson sees Holmes on the edge of the roof of St. Bartholomew’s Hospital. A tearful Holmes explains that this call is his “note” and tells Watson that he is a fake. He orchestrated all the cases and none of it was real. Writing about it, reminds me of how emotional and beautiful the scene is as even now I start to tear up. Of course Watson believes none of it yet it is at that Holmes leaps from the roof and falls to his death. Watson tries to get to Holmes but is knocked down by a biker passing by him. When he gets to Holmes, he is dead. We see shots of the aftermath of this. One shot is Mycroft reading the Sun with the headline, “Suicide of Fake Genius”. Watson and Mrs. Hudson visits Sherlock’s grave. Watson still cannot believe that Holmes is dead and demands that he not be dead and to come out of where ever he is at. Nothing happens. 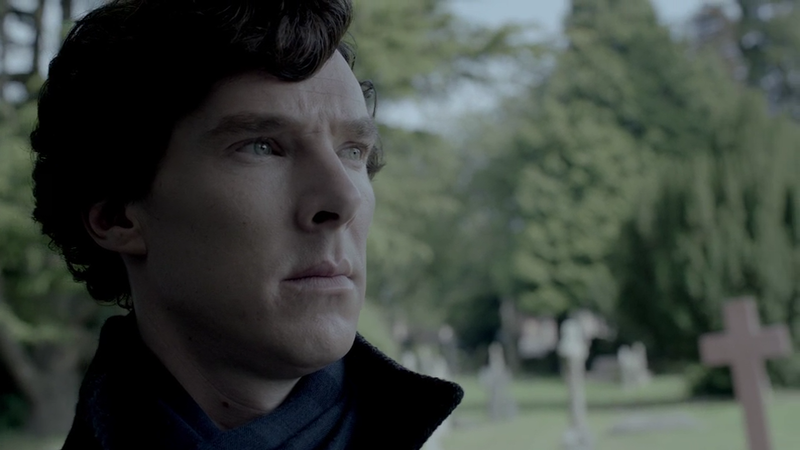 Sadly, Watson and Mrs. Hudson leave the cemetery yet watching from behind some trees is Sherlock Holmes. There are areas where I think Sherlock excels at and other areas where I think it tries to be too “clever”. To me, this applies both to the overall visual direction and the story telling. Don’t get me wrong, I think Sherlock is one of the most visually pleasing series ever made. It has to be very difficult to keep that standard up. In A Scandal in Belgravia, there is a shot that transitions Sherlock from a dream he is having with Irene Adler to him being in bed sleeping off a drug he had been given. It basically transitions the character standing in a field to a bed coming up behind him to show he is now asleep. It doesn’t work. When that scene starts, you can tell he is being shot on green screen to achieve the effect. What bugs me the most is the last shot of The Reichenbach Fall. Obviously, The Reichenbach Fall is a retelling of The Final Problem therefore we know that Holmes and Moriarty will die in some way. Knowing that Sherlock will be returning for a third series, we also know that Holmes will live. How will this be achieved? First of all, we see Moriarty take out a gun and kill himself in front of Holmes. Is he really dead, who knows! Characters never really die. Holmes is seen jumping from the roof of the hospital but at the end of the story we see he is alive. Now Moffat has said in an interview with The Guardian in regards to Holmes surviving that fall, "there is a clue everybody's missed ... So many people theorising about Sherlock's death online – and they missed it!" Now forgive me if I may sound a little cynical. You see, I watch Moffat’s Doctor Who too. Fine, so we missed the obvious or the clue but sometimes the clues are pretty miniscule to non-existent. For example, the opening story for Series 6 of Doctor Who, The Impossible Astronaut, we see the Doctor shot down, start to regenerate and fatally shot. Pretty heavy stuff! Then, when we get to the end of Series 6, The Wedding of River Song, we find out it wasn’t the Doctor shot at all but in fact a robot. 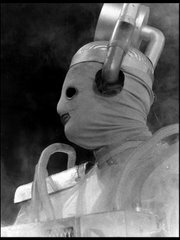 Maybe we find out that instead of Holmes jumping from the roof, it was a robot piloted by the Teselecta from Let’s Kill Hitler. Maybe, Holmes can re-boot the Universe so he doesn’t die at all; or the best of all maybe Danny Boy (The WWII pilot from Victoryof the Daleks) flies his Spitfire right under Holmes as he jumps, scooping him up to safety! I just would like to see the resolution be plausible. My concern is not even the jump or how it will be resolved, more so as to why we had to end the series on a shot showing Holmes had survived the jump. I don’t think anything would have been wrong if the series ended with everyone thinking Holmes was dead. I think most people knew the series was coming back. 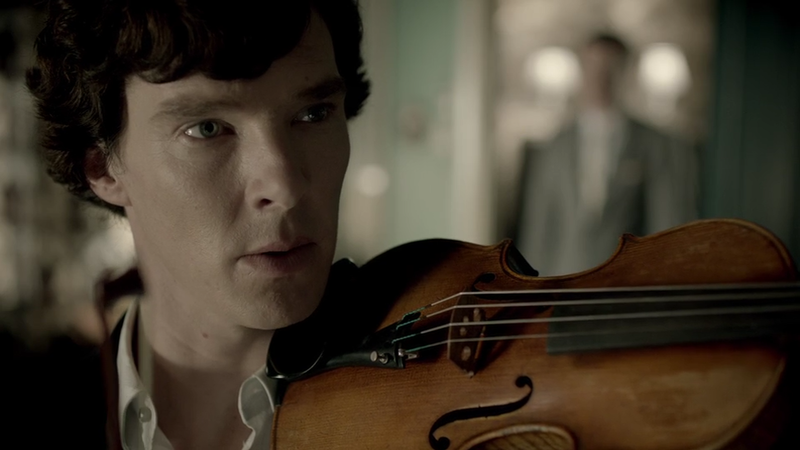 Showing him at the end, for me, ruined that beautiful scene with him on the roof and talking with Watson on the phone. As with Series 1, I thought the main cast was perfect. Benedict Cumberbatch is amazing as Holmes. He is perfect for it just as Jeremy Brett was perfect for the Granada series. The timbre of their voices is very similar too. The funny thing is that I think Cumberbatch probably wouldn’t play the 19th century Holmes as well. I don’t think he would be as successful at it. This role is perfect for him and is a treat to watch. There is always talk of fans wanting him to be in Doctor Who as The Master or something like that. Quite honestly, and I can’t believe I am saying this, why not have him in Doctor Who as his Sherlock Holmes character and do a crossover. Matt Smith as the Doctor working with Cumberbatch’s Holmes would be a lot of fun. That way you could also have the new companion team up with Watson with them working together and Watson trying to impress her and fail as he does with all the other women he knows. That’s the closest you will ever get me to do fan-fic. Speaking of Watson, Martin Freeman is great as Watson. In some ways it seems like he had less to do in this series but yet looking back on it, I can’t back that statement up. I don’t know why I feel that way but I do. It certainly feels like more stress was but on Holmes and Watson’s friendship and the strong bond they have together. This is also the second week in a row I watched something with Una Stubbs now. Last week, I wrote about the 1981 episode of TillDeath…. with her playing Rita. She is 74 now and still looks great. I have always enjoyed watching her in everything she was in. Andrew Scott as Moriarty has really grown on me. I am not sure if his performance was toned down or if I finally had time to get used to it. In this role, he was asked to do a lot of different things which must have been a treat for the actor. I think one of my favourite scenes is how he is playing “Richard Brook” as he is trying to fool Watson in believing that all the cases Holmes had been solving was Holmes’ own invention. I would like to see Moriarty back in the series but if you are going to kill him off as they did here, it would be nice if they keep him dead. Otherwise, to me, the series loses credibility and becomes almost a superhero parody. It came dangerously close to this with A Scandal in Belgravia based on how many times Irene Adler “died”. 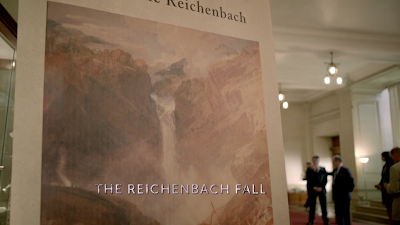 The Reichenbach Fall took some of its plot from The Final Problem while still being a fresh story on its own merits. Obviously Holmes and Moriarty come to their end at the story. Also, in The Final Problem Moriarty sends a note via a boy to Watson at the Falls saying an Englishwoman is sick and needs a an English Doctor. Watson goes back yet Holmes knows that this is a hoax. In The Reichenbach Fall, Watson gets a phone call that Mrs. Hudson was shot and he needs to go back immediately yet Holmes knows this is the work of Moriarty. Even the phrase “The Final Problem” is mentioned by Moriarty and Holmes throughout the story. Moriarty sees Holmes as his final problem and eventually Holmes sees it this way too. There are some things reminiscent in The Reichenbach Fall that are from The Final Problem but inverted. For example, in Doyle’s story Holmes and Watson go on the run to get away from Moriarty’s men. 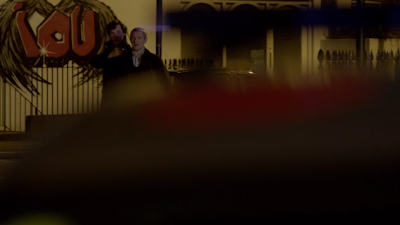 In The Reichenbach Fall, Holmes and Watson are on the run from Lestrade’s men. In fact the terrorist and snipers are trying to protect Holmes because they think he has Moriarty’s code that doesn’t exist. Even the Falls themselves are important. In Moffat’s & Gatiss’ version, Holmes never goes to Switzerland to the falls. The whole point is the paining he recovers is what brings Holmes to the attention of the world but it is also what Moriarty uses as the starting point for his plan to discredit Holmes. The Reichenbach Fall is the Fall of Sherlock Holmes. As for the paining that is returned at the beginning of the episode, it is a real thing. It was painted in 1804 by English artist J.M.W. Turner. The original resides at the Cecil Higgins Art Gallery & Bedford Museum in England. As I mentioned earlier, this was is a beautiful series to watch. The typography, the colour grading and how the shots are constructed are a real treat to watch and the BBC should be so very proud of this series. I watched this from the Blu Ray release and it looks great. It is not quite clear when a third series of Sherlock will be made. It sounds like production should begin next year. The third series was commissioned at the same time as the second. I think this is something to really look forward to in the next year or so. Next week: Not so much a final episode of a series or even a final episode of a season. In fact, it takes place in the middle of a series. If this were a radio station playing classic rock this might be considered a “deep cut” because it is not played very often or not too many people have seen it or know about it. I look at an episode of the Z Cars spin off series Softly, Softly as I watch Dead Aboard. I am on Twitter: @FromtheArchive I still have 1 follower! I have to admit I have not watched any Sherlock. When I first heard about it. I thought "What is the point? Why do they have to mess with the classic stories and give them a 'modern retelling'?" I was determined to despise the show without even giving it a chance. Since then I may have mellowed in my view, but still haven't bothered to watch any. Maybe I would if I still had BBC America, but lacking that, it is a (very small) effort to get it, and I just have not bothered. You should give it a shot. I had the same misgivings as you did but it's produced very well and the character of Holmes is preserved. Yes, he is in a different time than when he was created but it is tastefully and wonderfully done. It basically transitions the character standing in a field to a bed coming up behind him to show he is now asleep. It doesn’t work. When that scene starts, you can tell he is being shot on green screen to achieve the effect. Actually, the scene was filmed live in the field, with no greenscreen. The bed was on hydraulics and was raised up behind Holmes. Indeed. In fact after re-watching A Scandal in Belgravia, I realized I was talking about the wrong scene. I meant the first scene where Sherlock is standing in Irene's home and bends down where he is suddenly looking through the car window and the driver. Regardless, I was wrong as that wasn't green screen either but clearly shot on location which is what caught my eye. The lighting wasn't quite right. Now, looking at it again, I appreciate the scene more because it is not green screen which seems to be what everyone does now a days. Thanks for sending along the note ariandevere!